York used funds he received from the movie Sergeant York to promote education and his religious convictions through creation of an interdenominational Bible School. The facility would train song leaders, Sunday School teachers, lay ministers and others as well as offer formal Vacation Bible School curricula. The elegant structure, constructed of wood and stone from the immediate vicinity, had a sanctuary, classrooms and office space. The facility operated for about a year before it was closed at the outbreak of WWII. York's crowning educational achievement was the establishment of York Institute in Jamestown and the construction of the stately building now listed in the National Register of Historic Places by the U.S. Department of the Interior, which has also deemed the building to be of national significance. work they have chosen to do." Possessing little education himself, York hired an assistant and tutor, Arthur Bushing, and became an accomplished, entertaining speaker, playing to packed houses throughout the U.S., enticing the crowds with the re-creation of his role in the battle on Oct 8, 1918, and ending with a plea for support of the York Institute. The building opened in 1929 and was abandoned in 1979 for a newer structure, which is still operated as the only state-owned high school in Tennessee, having been relinquished to the state in 1937 after York's many political and financial battles to keep it open. Sgt. York presided over every graduation ceremony until his stroke in 1954 and continued to make regular visits to the school into the late 1950s, until he grew too frail. Erected by Tennessee State Parks - Sgt. 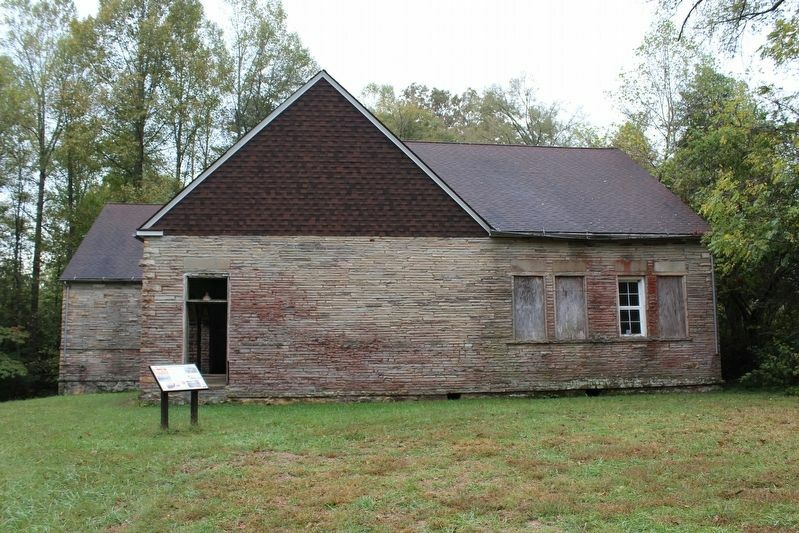 Alvin C. York State Historic Park. Location. 36° 32.95′ N, 84° 57.65′ W. Marker is in Pall Mall, Tennessee, in Fentress County. Marker can be reached from Wolf River Loop. Touch for map. Sign pointing to marker is located .3 mile west of Wolf River Methodist Church. Marker is in this post office area: Pall Mall TN 38577, United States of America. Touch for directions. Other nearby markers. At least 8 other markers are within 3 miles of this marker, measured as the crow flies. Wolf River Valley (approx. 0.4 miles away); Sgt. Alvin C. York's Personal and Spiritual Life (approx. 0.4 miles away); Sgt. Alvin C. York - America's Greatest Civilian Soldier (approx. half a mile away); Alvin and Gracie York's Home and Farm (approx. half a mile away); Wolf River Cemetery (approx. half a mile away); Sgt. York at Work (approx. half a mile away); Sgt. Alvin C. York State Historic Area (approx. half a mile away); Affair at Travisville (approx. 3 miles away). Touch for a list and map of all markers in Pall Mall. More. Search the internet for Sgt. 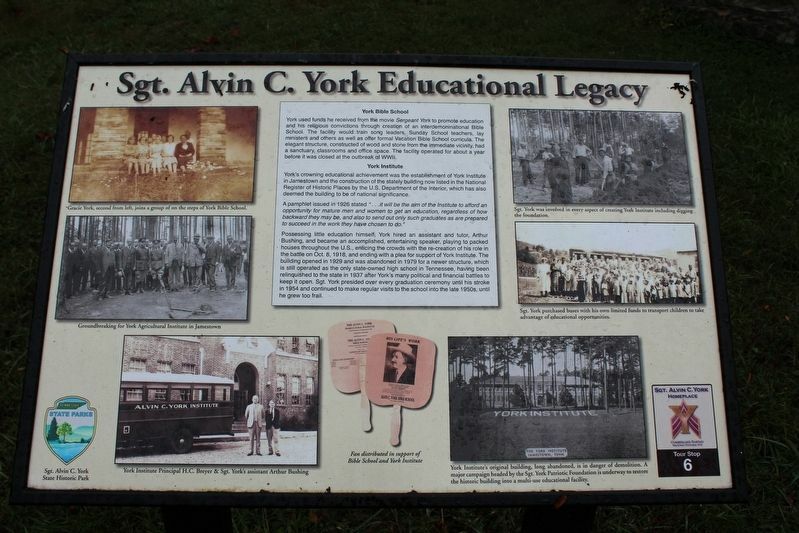 Alvin C. York Educational Legacy. Credits. This page was last revised on November 8, 2016. This page originally submitted on October 17, 2016, by Tom Bosse of Jefferson City, Tennessee. This page has been viewed 194 times since then and 9 times this year. Last updated on November 5, 2016, by Byron Hooks of Sandy Springs, Georgia. Photos: 1, 2. submitted on October 17, 2016, by Tom Bosse of Jefferson City, Tennessee. • Kevin W. was the editor who published this page.